This small temple, designed and built in the lifetime of a single pharaoh, is a typical New Kingdom temple. It comprises an entrance pylon with two towers flanked by statues, a central doorwrav leading to an open court (surrounded by colonnades), and a covered terrace to the rear. From the terrace a doorway leads to the Hypostyle Hall that is roofed; the difference in height between the central and side columns is made up by square pillars which allow light into the otherwise darkened hall. Beyond lies the Sanctuary, or Holy of Holies, where the sacred statue of the god was kept. In this temple there were three sanctuaries, for Amon, Mut and Khonsu. In a typical temple, the pavement rises progressively and the roof lowers from the entrance to the sanctuary; this is symbolic of the primaeval hill rising from the eternal ocean. The temple also gets progressively darker, from the open court to the inner sanctuary; from the known towards the mysterious. Only the pharaoh, or the high priest in his stead, was permitted to enter the darkened sanctuary, and to cast his eyes on the statue of the god. The inner walls of a temple were usually covered with reliefs depicting religious scenes, ritual celebrations and sacrificial offerings in honour of the gods. The outer walls were decorated with heroic scenes of war and conquest. Ramses III recorded his victories on the entrance pylon (a). The left-hand tower shows him wearing the Double Crown. He holds a group of prisoners by the hair with one hand and raises a club to smite them with the other. Amon stands before him, handing him the Sword of Victory and delivering to him three rows of conquered cities. These are represented as a human figure rising out of a symbolic fort that bears the name of the city. On the right-hand tower the theme is repeated but with Ramses wearing the Red Crown of Lower Egypt. Two statues flank the doorway over which Ramses, in relief, receives the symbol of Life from Amon. 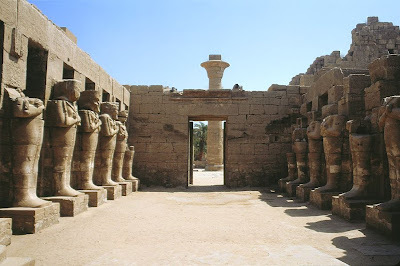 The open court is surrounded by covered passages on three sides, each supported by eight square pillars with statues of Ramses III in the form of Osiris before each. The terrace to the rear has four square pillars and four columns with bud capitals. The reliefs on the left-hand rear wall of the pylon show Ramses receiving the hieroglyph for Jubilee from the enthroned Amon. On the right- hand wall is a procession of standard-bearers and Ramses leading the priests who bear the sacred barges of the Theban triad. The Hypostyle Hall, which has eight columns with papyrus-bud capitals, leads to the three sanctuaries. The reliefs show Ramses making offerings before the sacred barge of each god: Amon in the central chamber, Mut to the left and Khonsu to the right. Returning to the Great Court, we turn east and approach the Second Pylon (P. 2) that dates to the beginning of the 19th Dynasty. The core, as already mentioned, contained thousands of the sand-stone blocks from the Sun Temples. Also buried were discarded statues, such as the huge red granite statue of Ramses II, usurped by Pinedjem, son-in-law of the high priest of Amon. It was buried under the ruins of the northern tower and now stands to the left of the central doorway (b). A small figure of Nefertari, one of the most complete statues ever found of this beautiful queen, stands in front of his legs. The Great Hypostyle Hall (4), with its 134 columns arranged in sixteen rows, covers an area of 4,983 square metres. It is the largest single chamber of any temple in the world. The double row of central columns, which lead towards the sanctuary, are higher than the side columns. Their shafts are smooth, and they soar to a height of twenty-one metres. The spreading calyx capitals retain much of their original colour, as do the massive architraves. The shorter side columns have bud capitals. The discrepancy in height is made up by square pillars between the steps of the roof that provided the only light when the hall had its original roofing. The Hypostyle Hall was decorated throughout. All the walls and the shafts of the columns were covered with reliefs and inscriptions showing adoration of the deities, especially Amon-Ra. Seti I was responsible for the entire northern half of the hall, and Ramses II built the southern portion, but many other 19th Dynasty pharaohs recorded their names there. 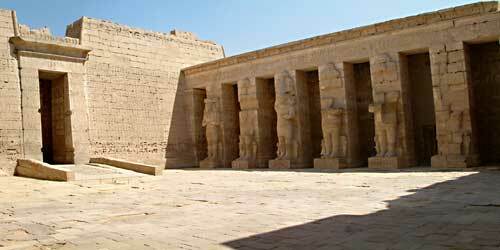 On the outside of the Hypostyle Hall are some important historical reliefs. On the southern wall is a record of Ramses II’s Battle of Kadesh, which contains the actual text of the treaty with the Hittites. On the northern wall are scenes of Seti I’s battles which took place in Lebanon, southern Palestine and Syria. At (c), in the upper row, we can see Seti I in his chariot shooting arrows at the enemy charioteers, cavalry and infantry who are depicted in flight. Some of the inhabitants of the conquered territory take refuge in a fortress surrounded by water. To the right Seti appears in three scenes: he binds captives, marches behind his chariot dragging four captives, and leads rows of captured Syrians to Amon, Mut and Khonsu. In the lower row there is a triumphal march through Palestine. Seti stands in his chariot. The princes of Palestine honour him with uplifted arms while he appears to turn towards them in acknowledgement. Further along the wall is the battle against bedouin tribes in southern Palestine: some of the survivors flee to the mountains. The victorious Seti returns from Syria, along with captives. The boundary between Asia and Egypt is marked by a canal. On the Egyptian side priests and officials welcome Seti, and he delivers the captives and the booty to Amon-Ra. To the right of the doorway, at (d), are three rows of battle reliefs: the storming of Kadesh in the top row; the battle against the Libyans (with pig-tails and feathers) in the middle row; and the battle against the Hittites in northern Syria in the bottom row. On both sides of the doorway are huge reliefs of Amon-Ra who, in return for the tribute and the several rows of captured territories, which he holds by cords, presents the Sword of Victory to Seti. The Third Pylon (P. 3) was built by Amenhotep III, and it once formed the entrance to the temple. During drainage operations in recent years, prior to reconstruction of the pylon, it was discovered that hundreds of blocks of earlier structures had been buried in its core. Among those that have been reconstructed are a magnificent 12th Dynasty pavilion built by Senusert I of fine-grained limestone, and an alabaster shrine of the reigns of Amenhotep I and Thutmose I.
Thutmose I ascended the throne early in the 18th Dynasty. He made the first major alterations to the original shrine of Amon-Ra built by the pharaohs of the Middle Kingdom, and also erected the first pair of obelisks at Karnak; one still stands in the Central Court between the third and fourth pylons. Pylons P.4 and P.5, were built by Thutmose I; Hatshepsut, his daughter and builder of the famous mortuary temple of Deir el Bahri (page 72), erected another pair of huge obelisks between them. Hatshepsut’s standing obelisk, erected in the sixteenth year of her reign, was made of a single block of pink granite and rises to a height of twenty-nine and a half metres. It is one of the two tallest standing obelisks (the other is in Rome outside St John Lateran). The inscription records that it was quarried from Aswan, transported, and erected in seven months; a considerable feat in view of the fact that it weighed some 323 tons. The base of the second obelisk is still in situ; the upper part is near the Sacred Lake (page 70) and fragments have been taken to the museums of Boston, Liverpool, Glasgow and Sidney. Passing through the doorway of the Fifth Pylon (P.5) we enter Thutmose I’s second colonnade. It is now very much in ruin. Beyond rises the sixth and smallest pylon (P.6) erected by Thutmose III and restored by Seti I. On each face are lists of the tribes of Nubia, Kush and Syria, which were subjugated by Thutmose Ill’s army. The conquered territories are, as usual, shown as an elliptical hieroglyph character surmounted by a human bust with arms bound behind the back. Beyond the sixth pylon is the Hall of Records; its characteristic feature is a pair of stately granite pillars, one bearing the lotus of Upper Egypt and the other the papyrus of Lower Egypt. Together they symbolise unity between the Two Lands. 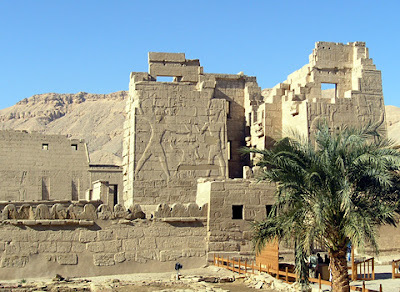 This hall, constructed by Thutmose III, was where the priests of the temple kept detailed records of the sources of gifts and booty from the conquered countries. Two fine statues of the god Amon and goddess Amenet, with the features of King Tutankhamon and Queen Ankhesamon, stand to the north of the hall. The Sanctuary (e) lies directly to the rear. The inner shrine is made of pink granite and carved with fine reliefs. The ceiling is adorned with stars on a black background, and the representations are of Philip Arrhidaeus, the half-brother of Alexander the Great who succeeded him to the throne, being crowned, presented to the gods and seated before an offering table. A corridor runs around the sanctuary, enabling us to view the finely carved reliefs, particularly on the outer southern wall (to the left of the sanctuary). These are in four rows showing the pharaoh undergoing purification with water and other rituals attending his entrance into the sanctuary. There are also offering scenes and a fine representation of the sacred barge of Amon.